The​ ​specialty​ ​food​ ​event​ ​gathers​ ​companies​ ​from​ ​all​ ​over​ ​the​ ​world.​ ​At​ ​the​ ​2017​ ​Winter​ ​Fancy​ ​Food in​ ​San​ ​Francisco,​ ​numerous​ ​​ ​were​ ​the​ ​Italian​ ​exhibitors, between ​traditional​ ​Mediterranean​ ​cuisine,​ ​research,​ ​innovation​ ​and​ ​Italic​ ​traces. Among all American cities, few others can contend for the crown of the overseas foodie capital. Everything in San Francisco talks about food. And not any food, but gourmet, sustainable, organic, local food. Frisco is the perfect destination for a gastronomic tour. And for this reason, the Fancy Food Show around there is a serious thing. Even though smaller than its New York equivalent, the gastronomic event organized by the Specialty Food Association for over 60 years gathers companies from all over the world. And, even on the West Coast, Italy does its part. 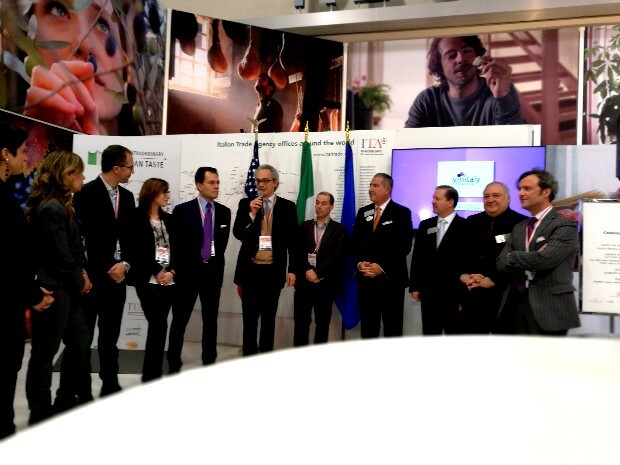 At the opening of the Italian pavilion at the Winter Fancy Food, Consul Lorenzo Ortona (in the middle speaking in the mic) and ITA Director, Maurizio Forte (to the right of the Consul) addressed exhibitors and visitors. 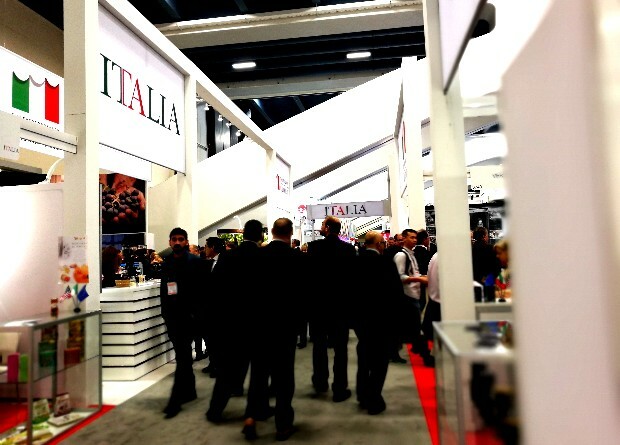 The Italian pavilion at the Moscone Center in San Francisco. Among the stands at the Italian pavilion there are all the classics of the genuine Italian cuisine, from pasta and oil to coffee and cheese. The Di Rados followed the entire journey of this product for connoisseurs. Anthony Di Rado explained that “we don’t aim for the large distribution, but we target more the specialty food stores, as we do in Italy. 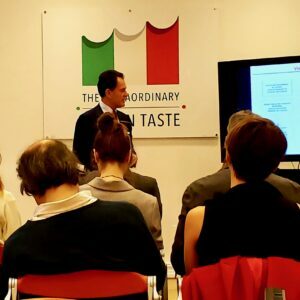 We collaborate a lot with restaurants because the chef recognizes the quality of the product right away: the pasta speaks for itself.” Even though the Cocco brand looked at the American markets ever since its creation, according to the Di Rados, there is still a lot to do in order to “educate” the average American consumer on the high-quality Italian products. Recently, the Cocco family launched a new coffee business with the brand Officina 5. “One day, one of the Coccos brothers decided that he was interested in coffee: he started to research and to look for the best products, because the Coccos, when they do something, they make it high-quality.” And the Di Rado father and son are pioneers in America even in this new adventure, teaching about this new coffee on this side of the Atlantic. 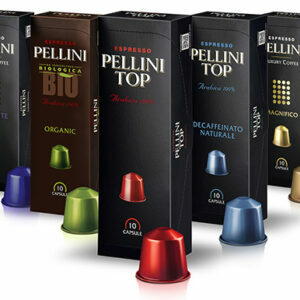 Pellini coffee cartridges for espresso. Coffee has always been, or at least since 1922, the Pellini family’s business, in Verona. The brand is the forth brand of coffee found in the houses of Italians and, in the last five years, grew a lot in Europe as well. 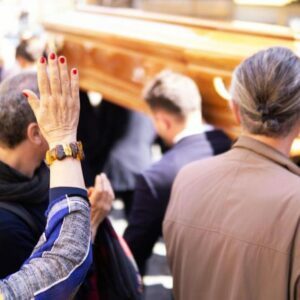 Today, it appears on the American market with enthusiasm, but also with due precautions. “We are in a phase of market analysis – Giacomo Cinelli tells us, the export manager of the company – and we are looking for the best strategies to employ for our products. Ours is a high end, premium placement, and we are researching the perfect packaging for the American market. We have a strong brand and an excellent quality, we are sure to have all the necessary elements to conquest a place in this market.” We expect to find them soon on the shelves of the East and West coast’s stores. 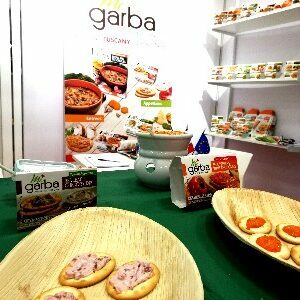 Mi Garba’s booth at the Winter Fancy Food. The New York wine bar is crucial to the company’s image, because it is a window for Mi Garba’s products, but a lot more as well: the young atmosphere fits with the area, all the pieces of furniture were imported directly from Tuscany, all the carefully selected wines on the menu are categorically Tuscan wines. 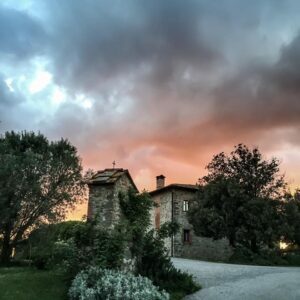 Chianti and Montalcino’s reds accompany the same dishes that the company sells in boxes. 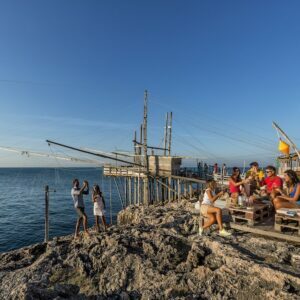 But above all, the wine bar is a way for this still new brand to get to know and interpret the public’s taste: “In the wine bar we listen to our clients and we have the chance to explain that what we now sell in boxes was made eight days ago in Tuscany. Everyone is so shocked of the fact that they are boxed products. We are faithful to our recipes, but at the same time we welcome suggestions from the American market, without cheating on traditions.” Mi Garba is entering the American large-scale retail trade and it can be found already on the East Coast, in Chicago and in Texas, where all lovers of Tuscan cuisine can taste grandma’s risotto, barley soup or ribollita directly at their homes, even though grandma stayed in Italy. If it is almost impossible that someone would be able to compete against Tuscans on the ribollita, there are many Italian products that find valid competitors in California. 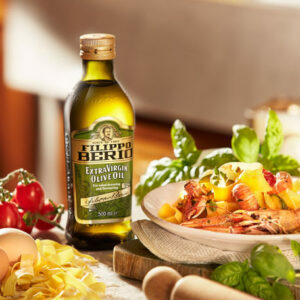 Specifically, we are talking about olive oil, a product that has seen a strong and aggressive growth of the products made in California in the past few years. 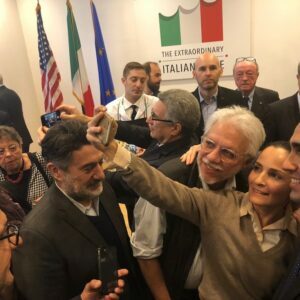 However, Italians are not afraid of the competitors and have already established a historical presence on this side of the ocean. 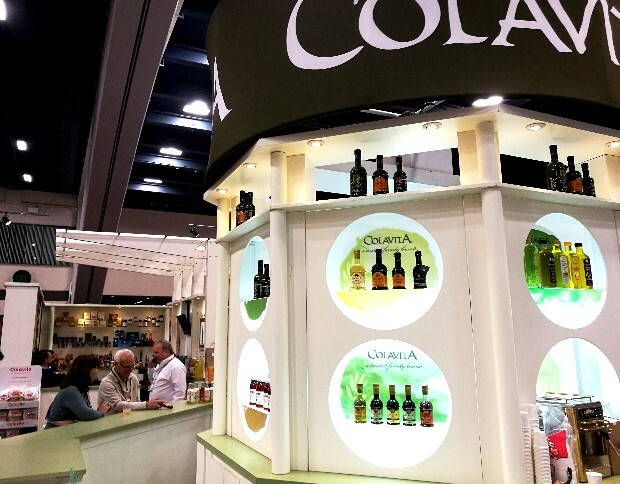 Colavita’s booth at the Winter Fancy Food in San Francisco. 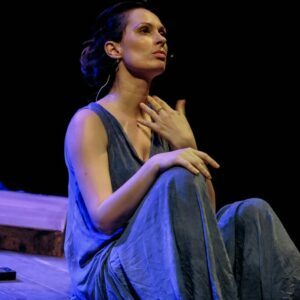 If it’s true that for some companies the place makes the brand, authenticity is not always a matter of geography. 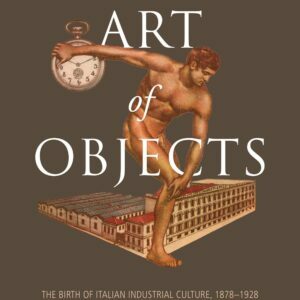 There are many products that were born out of the Italian tradition even though 100% American. And for the many Italian sounding products that use the Italian character as a bait, there are as many that whose products we like to call Italic. Resulting from immigration, those products tell the story of a complex Italian-ness, not enclosed by the country’s geographical borders. 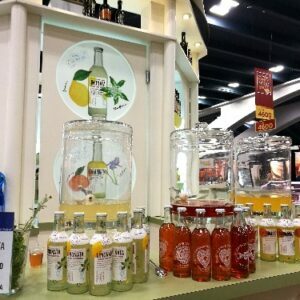 Christian and Kristina Fogliani, italics at the Winter Fancy Food. 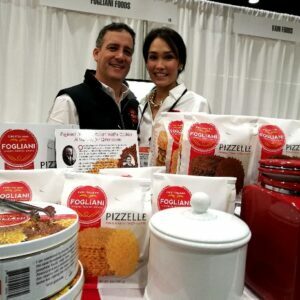 We bumped into a good example of this at the Winter Fancy Food: Fogliani, a Californian company with an Abruzzo’s heart and the Italian claim: “vivere, ridere, amare” – live, laugh, love. 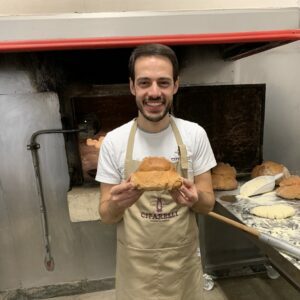 Christian Fogliani and his wife Kristina are the owners and managers of the company that produces sweets following the family recipes. Fogliani’s forte are the pizzelle, that, to explain to all people that are not from Abruzzo, are cookies like the Belgian waffles that you can find everywhere from the Adriatic see to the Gran Sasso, so much so that every family in Abruzzo used to have a stamp with the family initials. 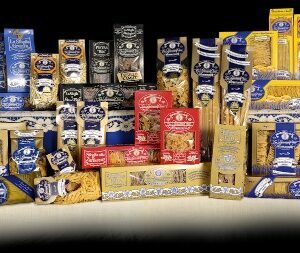 “My grandfather arrived in the United States in 1904 from Abruzzo and started his first pasta factory and then a cookie factory. 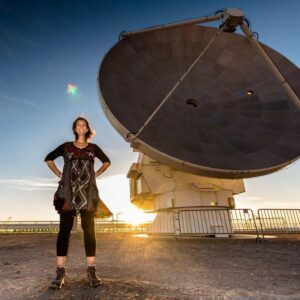 I was a lawyer until one day, a couple of years ago, I decided I wanted to do something that was more meaningful to me and I decided to go back to the cookies. Pizzelle are our own new idea that we came up with from an old recipe that belonged to my grandma. The most exciting thing is that there are people that still remember their grandma or aunt making these cookies.” Italians emigrate, generations pass, but recipes stay.